This salad, with toasted pecans and a vinaigrette of maple syrup and orange juice, is one of our favorite ways to bring nutritious sweet potatoes to the table. And if you were looking for a perfect side dish to serve for Thanksgiving, you can call off the search. 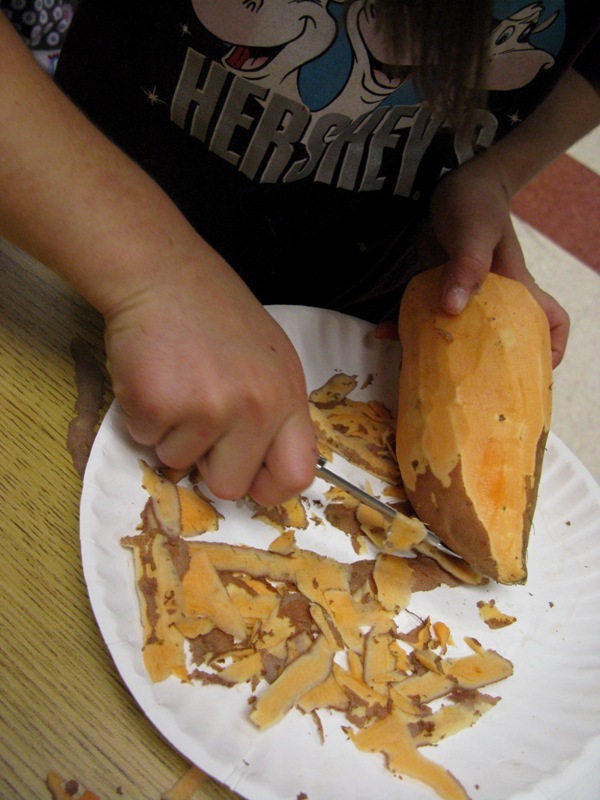 The kids in our food appreciation classes also love sweet potatoes and they had plenty of fun making this salad. First, turn your oven on to 350 degrees and toast 1/2 cup chopped pecans. Meanwhile, peel two large sweet potatoes (about 2 pounds) and cut into 3/4-inch dice. Toss the sweet potatoes with just enough olive oil to coat, season with salt and pepper and spread on two baking sheets. Place in the oven until they are just cooked through, then set aside to cool. 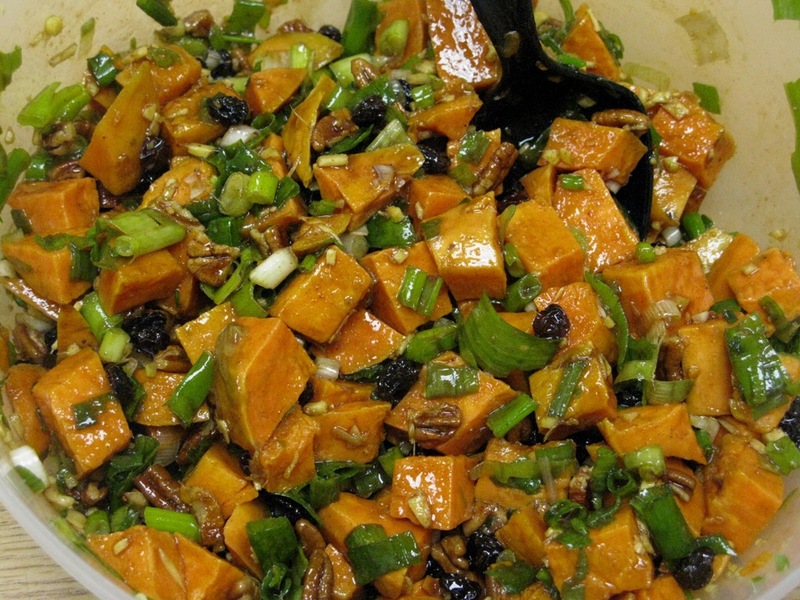 In a large bowl mix together the sweet potatoes and toasted pecans along with 1 bunch green onions finely chopped, including green parts, a fistful of chopped parsley, a small knob of fresh ginger, minced, and 1/2 cup raisins. For the dressing, mix together in a separate bowl 1/4 cup extra-virgin olive oil, 1 tablespoon maple syrup, 1 tablespoon orange juice, 1 tablesoon balsamic vinegar, 1/2 tablespoon lemon juice, 1/4 teaspoon cinnamon and 1/4 teaspoon nutmeg. Stir until thickened. Dress the salad and serve at room temperature. Just found a new side dish for Thanksgiving dinner…thanks. Excellent choice for Thanksgiving, Mendy. Much better than the yams smothered in brown sugar and marshmallows.